Will + Caity are a dream. They love each other so much it's crazy, and love those around them so well. Caity is a bohemian creative goddess. 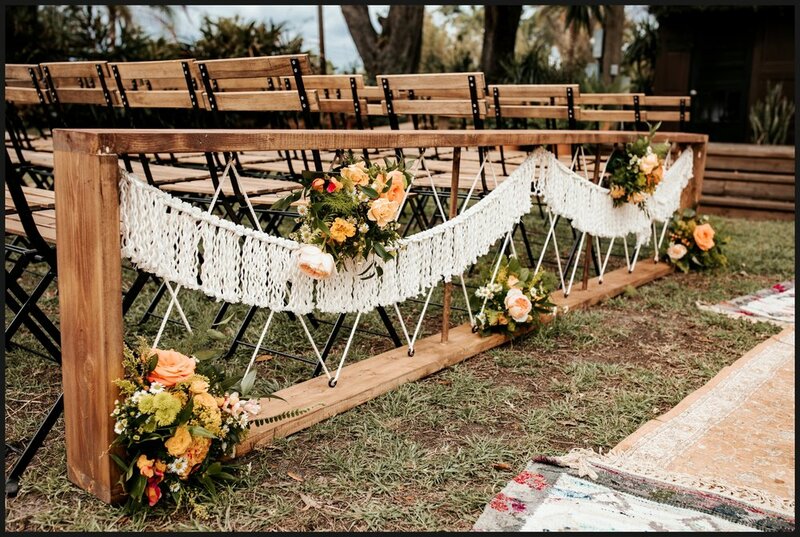 She had so many details that came together beautifully on their day, from a macrame backdrop at the altar, to flower crowns and complete with a handmade tee-pee made by her! At their reception Will made a guest appearance with the band everyone danced the night away. We were so honored to be a part of this amazing day and wish Will + Caity a hundred years of happiness together! Don't you just love when you're around a couple that is completely head over heals for each other? Well that was basically how it was all day with Marissa and Kyle. They just couldn't wait to finally be married to each other, which made total sense because they were obviously made for each other. We loved being a part of Katie and Tyler's wedding at one of our favorite venues, The Acre Orlando! Katie had the flower crown of every girl’s dream. There were so many unique details and we just couldn’t get enough. Pro tip: more flowers are always better. Sean and Anamaria are the type of people you meet and quickly become friends. Their love for each other and life is so contagious and a joy to be around. We loved getting to be there to capture this beautiful day for these two who are so loved by everyone who know them. We are grateful to know them and are excited to see how they change the world together as Mr. & Mrs! Brittany's smile was on her face all. day. long. She did a million eager giggles and was just so much fun to be around. Robert looked at Brittany as if she was the only one around and the only one that mattered. These two have a love that is SWEET and we were pumped to be there to capture it. We knew Eric and Tay from college and their story is a sweet one. If you're around them for more than 10 seconds you'll see the way Eric pursues Tay relentlessly. That was one of our favorite parts of their wedding - at any moment you would see Eric giving Tay a quick kiss on the cheek or just smiling into her eyes so she knew without a doubt that she was the only thing on his mind. Their marriage is beautiful and points to Christ. They are incredible people and are going to change the world together.